Summer days are hotter than usual, and we seek ways and means of quenching our thirst. I have shared the recipes of several coolers and fruits juices on Rathika’s Nest. Still there may be times when one desperately needs a juice/cooler and there are no fruits in the refrigerator. Well, we fail to see what is right in front of us! I’m referring to humble tomatoes. 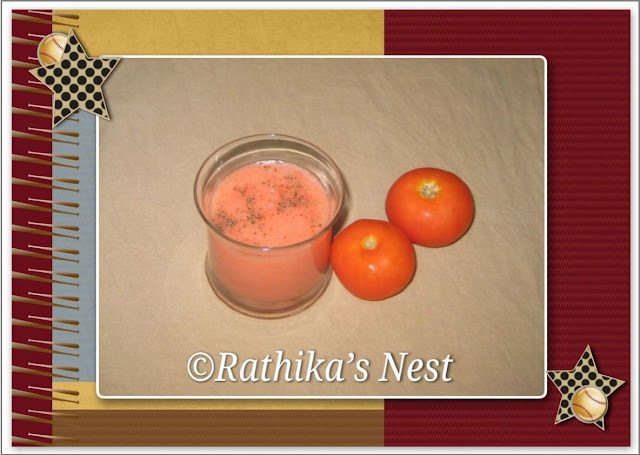 Yes, today we are going to make tomato juice (தக்காளிச் சாறு). Method: Wash the tomatoes and cut them into cubes. Blend them in a mixer with sugar and salt till it becomes a smooth puree. Add 300 ml of water and blend together. Transfer to serving glasses. Sprinkle pepper powder on top. Serve chilled.